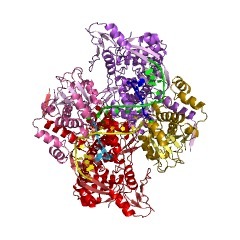 Type II topoisomerases are ATP-dependent enzymes, and can be subdivided according to their structure and reaction mechanisms: type IIA (topoisomerase II or gyrase, and topoisomerase IV) and type IIB (topoisomerase VI). 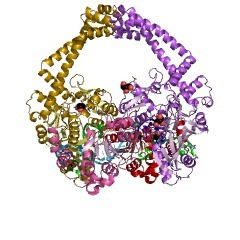 These enzymes are responsible for relaxing supercoiled DNA as well as for introducing both negative and positive supercoils [(PUBMED:7980433)]. 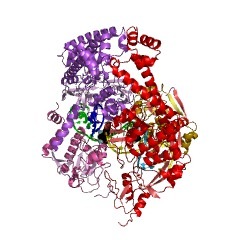 Type IIA topoisomerases together manage chromosome integrity and topology in cells. 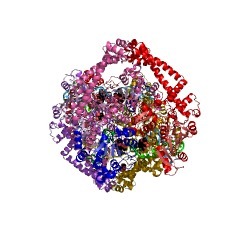 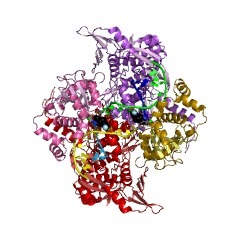 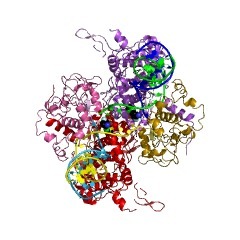 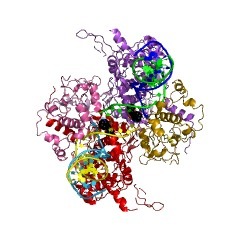 Topoisomerase II (called gyrase in bacteria) primarily introduces negative supercoils into DNA. 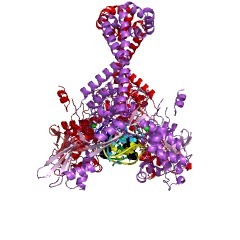 In bacteria, topoisomerase II consists of two polypeptide subunits, gyrA and gyrB, which form a heterotetramer: (BA)2. 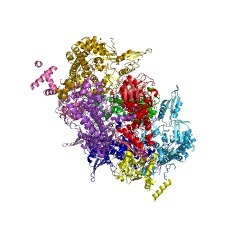 In most eukaryotes, topoisomerase II consists of a single polypeptide, where the N- and C-terminal regions correspond to gyrB and gyrA, respectively; this topoisomerase II forms a homodimer that is equivalent to the bacterial heterotetramer. There are four functional domains in topoisomerase II: domain 1 (N-terminal of gyrB) is an ATPase, domain 2 (C-terminal of gyrB) is responsible for subunit interactions (differs between eukaryotic and bacterial enzymes), domain 3 (N-terminal of gyrA) is responsible for the breaking-rejoining function through its capacity to form protein-DNA bridges, and domain 4 (C-terminal of gyrA) is able to non-specifically bind DNA [(PUBMED:8982450)]. 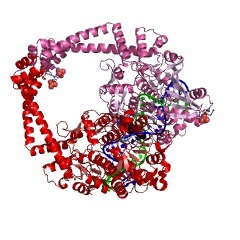 Topoisomerase IV primarily decatenates DNA and relaxes positive supercoils, which is important in bacteria, where the circular chromosome becomes catenated, or linked, during replication [(PUBMED:16023670)]. 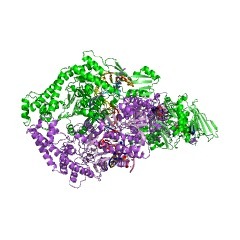 Topoisomerase IV consists of two polypeptide subunits, parE and parC, where parC is homologous to gyrA and parE is homologous to gyrB. 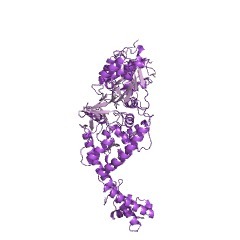 This entry represents DNA topoisomerase, type IIA. 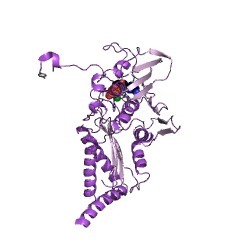 There are 42492 TOP2c domains in 42492 proteins in SMART's nrdb database. 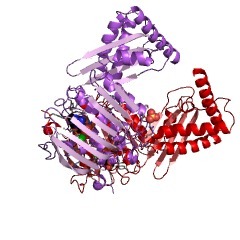 Taxonomic distribution of proteins containing TOP2c domain. This tree includes only several representative species. 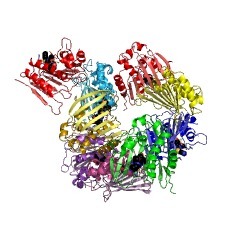 The complete taxonomic breakdown of all proteins with TOP2c domain is also avaliable. 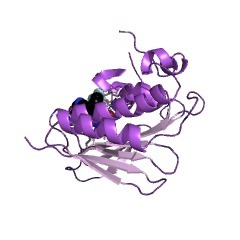 Click on the protein counts, or double click on taxonomic names to display all proteins containing TOP2c domain in the selected taxonomic class. 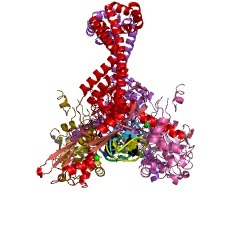 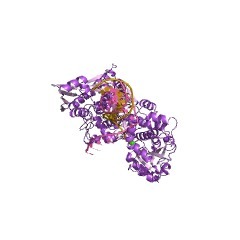 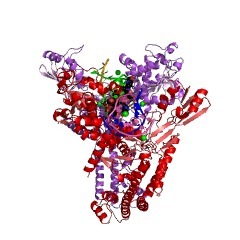 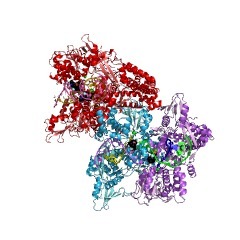 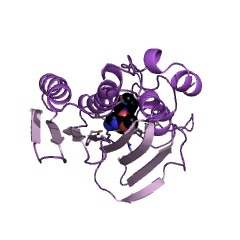 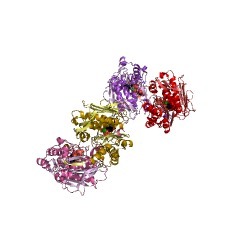 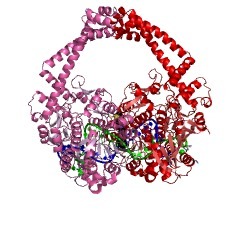 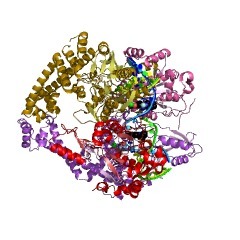 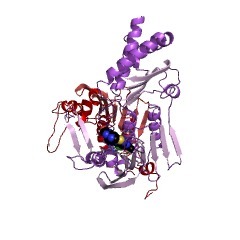 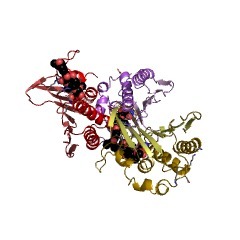 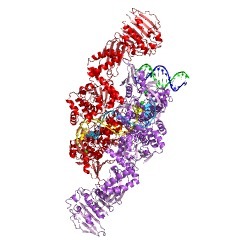 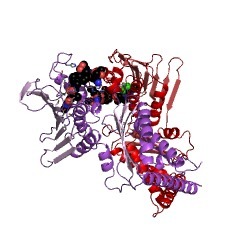 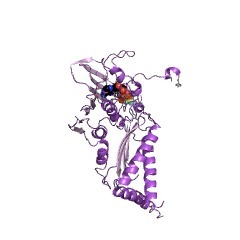 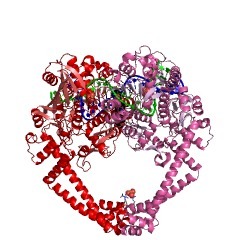 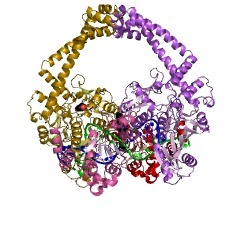 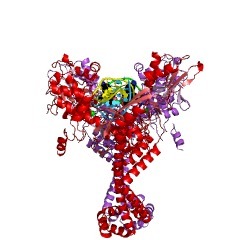 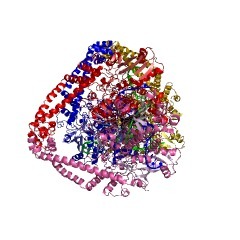 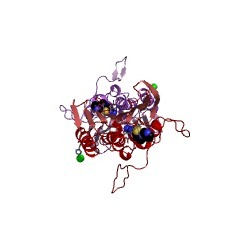 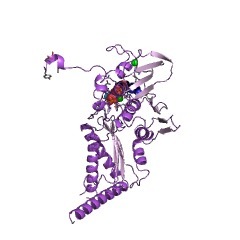 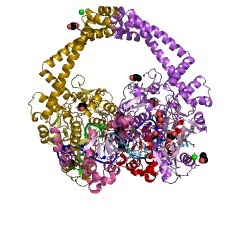 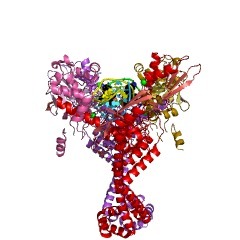 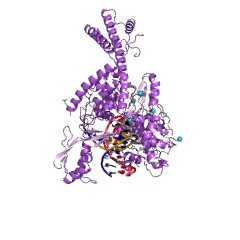 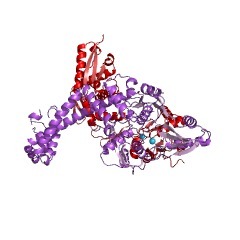 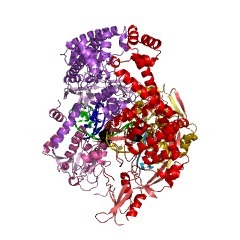 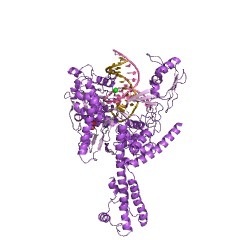 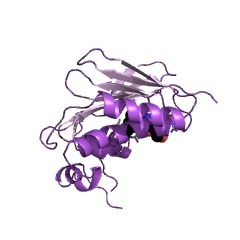 The crystal structure of an N-terminal fragment of the Escherichia coli DNA gyrase B protein, complexed with a nonhydrolysable ATP analogue, has been solved at 2.5 A resolution. 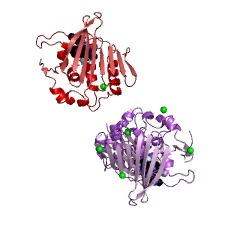 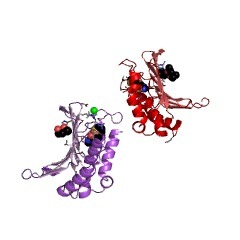 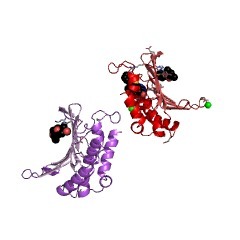 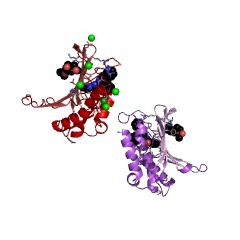 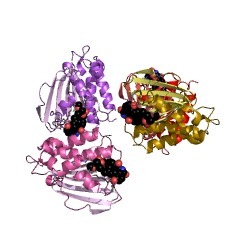 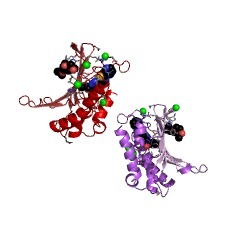 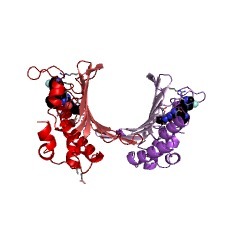 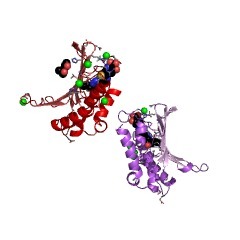 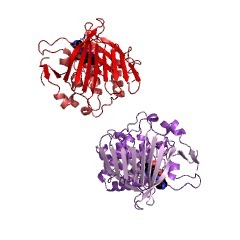 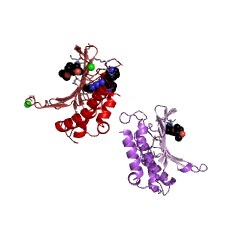 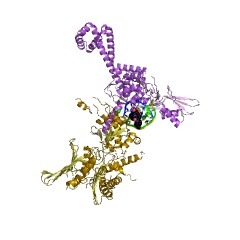 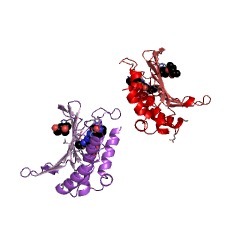 It consists of two domains, both containing novel protein folds. 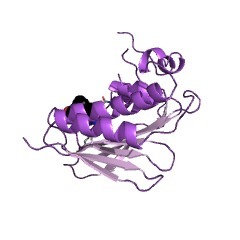 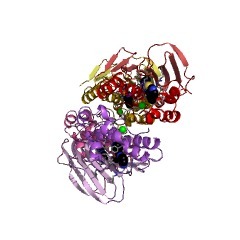 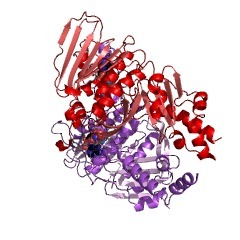 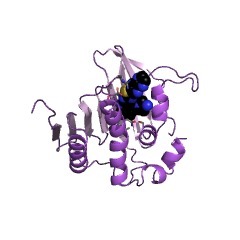 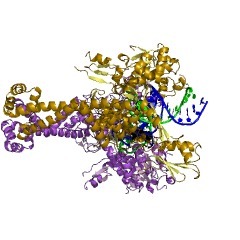 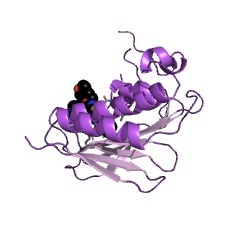 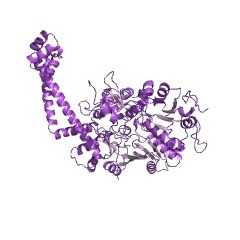 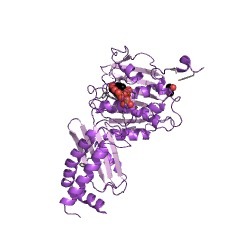 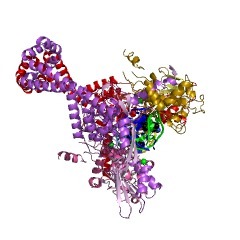 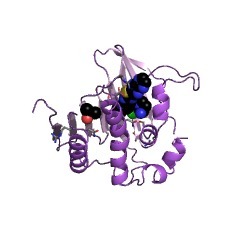 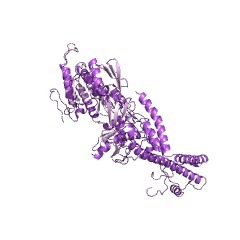 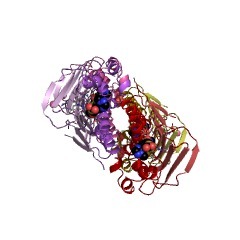 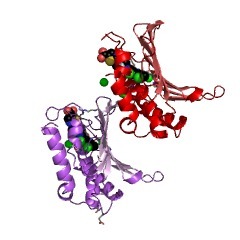 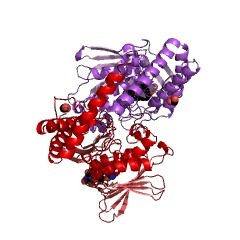 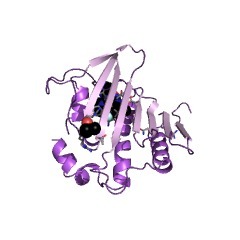 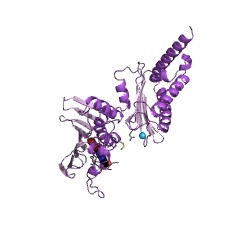 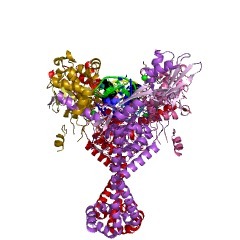 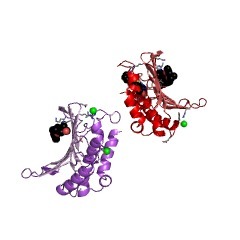 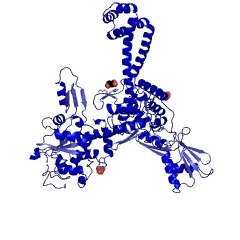 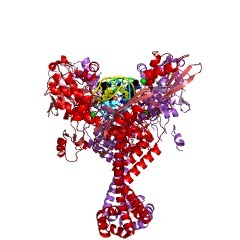 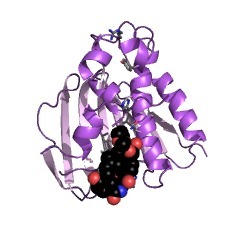 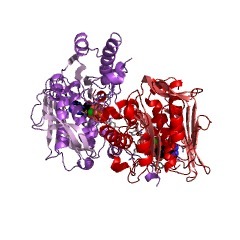 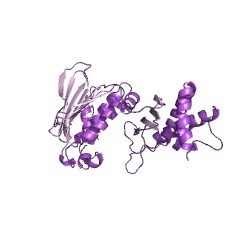 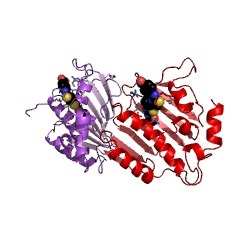 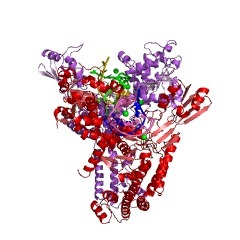 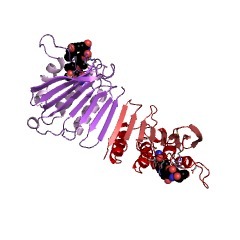 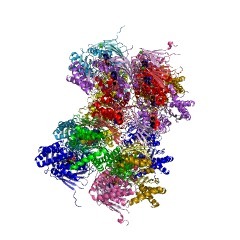 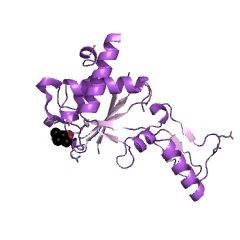 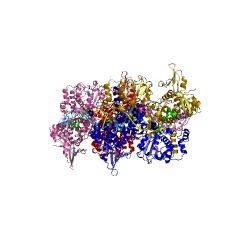 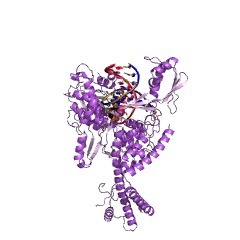 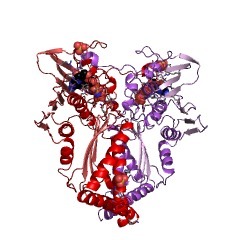 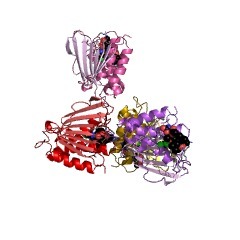 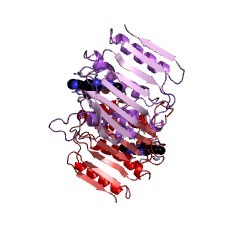 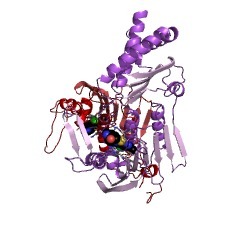 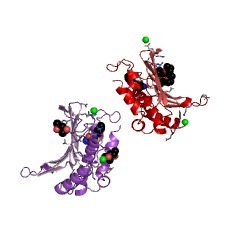 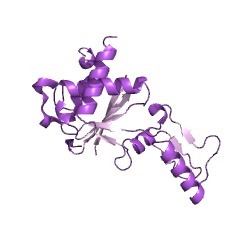 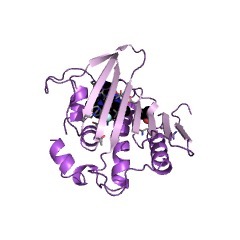 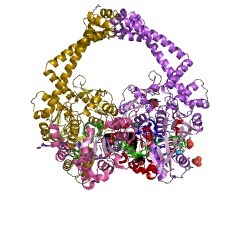 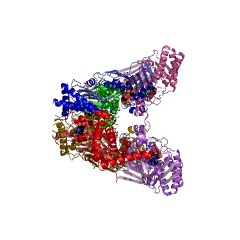 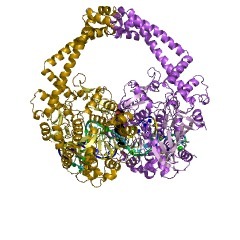 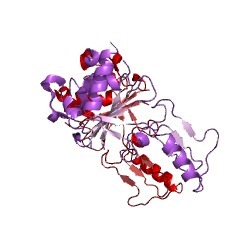 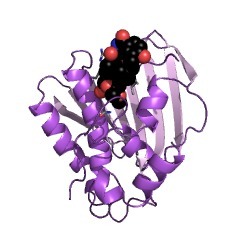 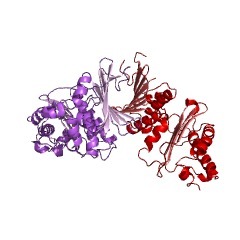 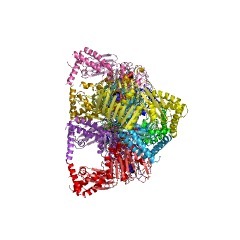 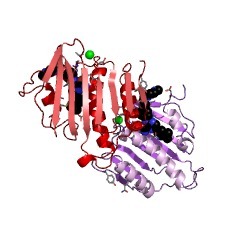 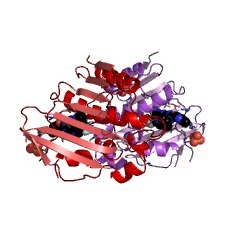 The protein fragment forms a dimer, whose N-terminal domains are responsible for ATP binding and hydrolysis. The C-terminal domains form the sides of a 20 A hole through the protein dimer which may play a role in DNA strand passage during the supercoiling reaction. 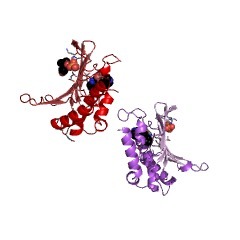 SwissProt sequences and OMIM curated human diseases associated with missense mutations within the TOP2c domain.